"ONE YEAR: The Art of Politics in Los Angeles"
Kohshin Finley, "Can You See Me Now?," 2017, oil and mixed media on canvas, 57 x 38"
"ONE YEAR: The Art of Politics in Los Angeles" is a well selected and illuminating survey that showcases recent political art by twenty well-established or emerging Los Angeles-based artists. Curated by Joey Forsyte, Lawrence Gipe and Alex Kritselis, all of whom are among the exhibiting artists, the exhibition was conceived in response to the tumultuous political upheavals of the past year. Not unexpectedly, topics include war, racism, gun violence, immigration and climate change. Notable highlights include large scale wall works by Gipe, Constance Mallinson, and HK Zamani. Gipe put in 24 hours creating a huge diptych drawing that juxtaposes a scene from the Baltimore riots of 2015 with a dramatic image of a Korean War bomber plane. Mallinson calls attention to environmental waste in a broad, meticulously detailed painting of a heap of detritus. Zamani challenges stereotyping in an oversized digital photo of an elegantly staged row of women cloaked in hijabs, each a different color so as to form a rainbow spectrum. Especially relevant to this moment of national division, a new series of orange crate label paintings by Ben Sakoguchi effectively documents political polarization by focusing on words and phrases that have recently become media jargon. Equally timely, a mesmerizing group of video portraits by Eileen Cowin features a racially diverse cast with similar facial expressions, reminding us that our shared humanity does indeed transcend any racial or ethnic barriers. Some of the most poetic works on view are by Keiko Fukazawa and newcomer Kohshin Finley. In a series of assemblages, Fukazawa subverts the implicit violence of weapons by feminizing them in the form of white porcelain assault rifles exquisitely covered in flowers and housed in simple boxes lined with lush fabric. 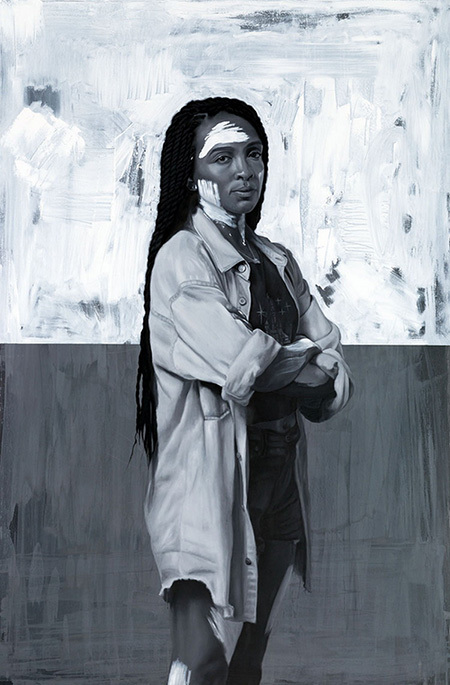 Finley's grayscale paintings of people of color, with patches of white painted to resemble bandages over portions of each subject's dark skin, put on display the artist's mastery of paint handling, while quietly inviting us to imagine the subjects asking how we might interact with them if were they white.